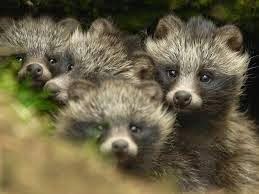 Tanuki are a wonderfully cute looking little animal native to Japan. Sometimes confused with badgers and racoons they're actually a completely separate species known as the racoon dog. 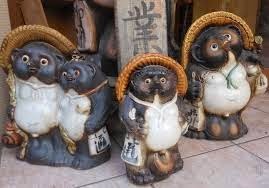 However "racoon dog" is nowhere near as romantic sounding as "tanuki" which has been incorporated deep into Japanese mythology. Legend has it that they are mischievous but friendly characters with the ability to change into many shapes to help the weary traveller including a hat to protect from the sun or even a tea pot to provide refreshment. They can often be seen at dusk stalking the sides of roads in the countryside and statues of them are everywhere across the country outside shops and restaurants to bring the patrons good luck. But I've never seen one in the city before. Today around dawn I was awoken by a single bark from my dog. He's not very big so as a guard dog he wouldn't really make the cut but as an alarm dog he's outstanding. And if he barks in the night I know there is something wrong. So I got up and looked out of a second floor window, straight into the eyes of a pair of staring tanuki, balancing on a power cable outside my house. They looked at me for a few seconds then looked away and carried on on their journey, along the cable to the main power lines and down the street balancing perfectly all the way. It was a rare sight and I'm glad I got up but the one thing that stood out for me was how clearly they were together as a pair. It was strange, and maybe part of their mythology, but I really felt that if they could have walked along those cables side by side, holding hands they would have. [Update] Since first writing this article a friend has contacted me and our friends here may not be tanuki after all but possibly palm civets. And those are vicious little critters.